Gilbert, Arizona is home to the first and only Sidewinder Subs. Owner, Doug Stauffer chose Gilbert as the home for Sidewinders in the fall of 2010. After working for nearly a decade in Gilbert, McQueen and Elliott was the perfect location for him to introduce customers to his passion for designing sandwiches. You’ll be hard pressed to find another restaurant that has the class, character and quality of this Gilbert sub shop. In addition to awesome subs, our Gilbert location boasts a broad selection of both bottled & on tap beers. The Fryer Menu, serving wings, fries, and corn nuggets (you gotta try them) is a perfect fit if you’d like to come watch the big game on one of our four large televisions or just kick back and have a good meal. 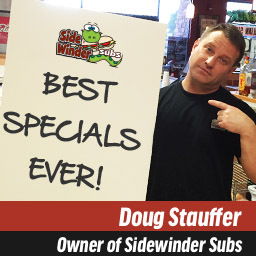 Doug has worked very hard to turn Sidewinder Subs into the sandwich shop you want to eat at! Our store boast four flat panel TV’s complete with satellite service. Combine the entertainment of satellite television with our large sports bar hi-top and banquet table seating, you’ve got the most sports friendly sub and sandwich shop in the East Valley. We will often run specials for big games and we send all of those specials out through our newsletter which you can sign up for here. Along with those specials, we send out a weekly deal that is exclusive for subscribers and lasts all week long. It’s the best way to stay on top of our best value!